Note: This post first appeared September 10, 2011; the recipe has been edited slightly to include some additional notes, a quick video on how to make this pumpkin banana chocolate chip bread was added (above) along with updated photography. The text is original and thankfully, our basement hasn’t flooded since this incident! Pumpkin banana chocolate chip bread doesn’t seem nearly as innovative these days as it apparently did to me 5 years ago but this recipe is still a winner nonetheless and the perfect way to ease into fall baking. Enjoy! 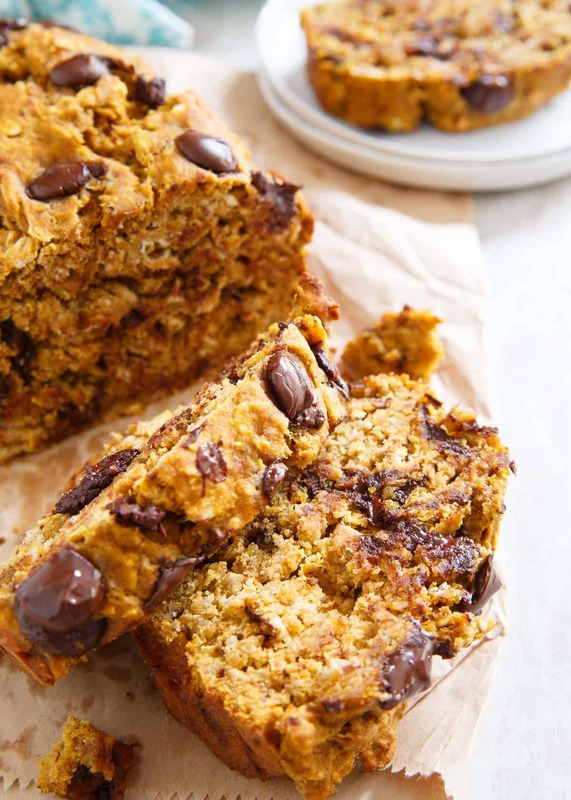 This pumpkin banana chocolate chip bread is a delicious fall treat sweet enough to be dessert and light enough to be breakfast. The perfect fall treat! Operation dry out the basement was in full effect yesterday. The good news is we now have a functioning boiler and air handler again. The central vacuum and treadmill however are still in critical condition. Doctor’s orders are time + dry air, fingers crossed for a full recovery. Ulysses may not be a chef or a masseuse, but I’d say handyman is a slightly better quality when things like this happen. Enough about water. How about pumpkin instead? Starbucks reintroduced the pumpkin spice latte this week so I figured it was an appropriate time to tap into the stockpile of Libby’s I hoarded from last year. Confession: I actually opened this can last Sunday for some pumpkin oats and it’s been sitting in my fridge ever since, desperately waiting to be incorporated into some baked good. I think this was worth the wait. Bananas are a staple in this house. Ulysses eats one every morning, I will almost always have at least 1/2 of one each morning, factor in snacks and we go through a “bunch” of bananas in about 2.5-3 days. Overripe ones are a rarity. So, when I came home yesterday from my trip to California and saw 3 bananas getting all brown and spotted I actually got excited to finally have some to bake with. I’m going to go out on a limb and say everyone has had banana bread at some point and many have had pumpkin bread before. 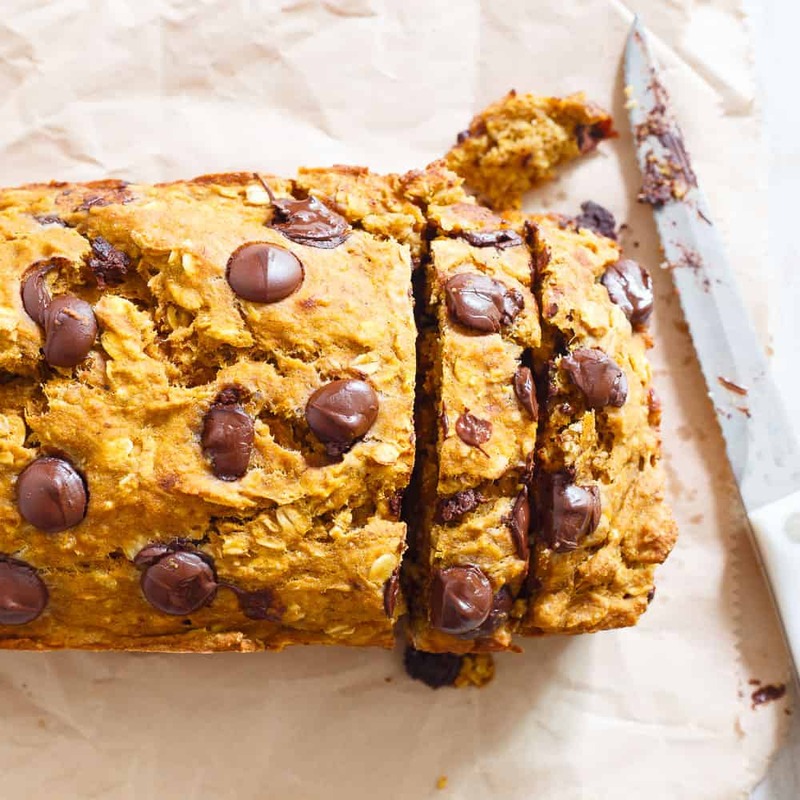 But, have you had pumpkin + banana + chocolate chips before? No? It’s kind of a match made in heaven. It’s healthy and light enough to be considered breakfast and sweet and chocolaty enough to qualify as dessert. A multifunctional bread. What more could you ask for? Preheat oven to 350 degrees and grease a 9x5 loaf pan liberally with baking spray. Mash bananas in a small bowl until smooth. Add the wet ingredients to dry ingredients and mix until well combined. Transfer batter into the loaf pan and smooth the top with a spatula. Top with additional chocolate chips. Bake for approximately 40-45 minutes or until toothpick comes out clean. Let cool in pan for 10 minutes before removing from pan and transferring to a cooling rack. Please spoon feed this to me right now. Match made is heaven is right! I haven’t spotted Libby’s yet in the grocery stores but once I do, I’m makin this bread! I’ll take two! Yum. I made pumpkin choc chip muffins that were pretty awesome. I bet this is just as wonderful. I had the pumpkin spice latte, but haven’t cooked pumpkin yet. This bread looks freaking incredible! Good luck with the basement! I would cry if my treadmill died. you didn’t even bring me a slice! :'( ……….Thats me crying!! I have not busted out the pumpkin yet — I do have a few cans in my pantry from last year though!As much as I love the cooler weather I’m not ready to bust it out yet. I love pumpkin + choc chips — a coworker of mine made this fabulous pumpkin/choc chip bread last year and it was so good. I bet yours is great too — I am a huge banana lover! Looks good. I’ll have to check out the kcal. Oh my goodness… do you do delivery. These are my favorite foods… all combined into one convenient package. Was this moist? Or does adding the oatmeal make it denser and firmer? It came out moist for me. I also prefer my breads slightly undercooked though. 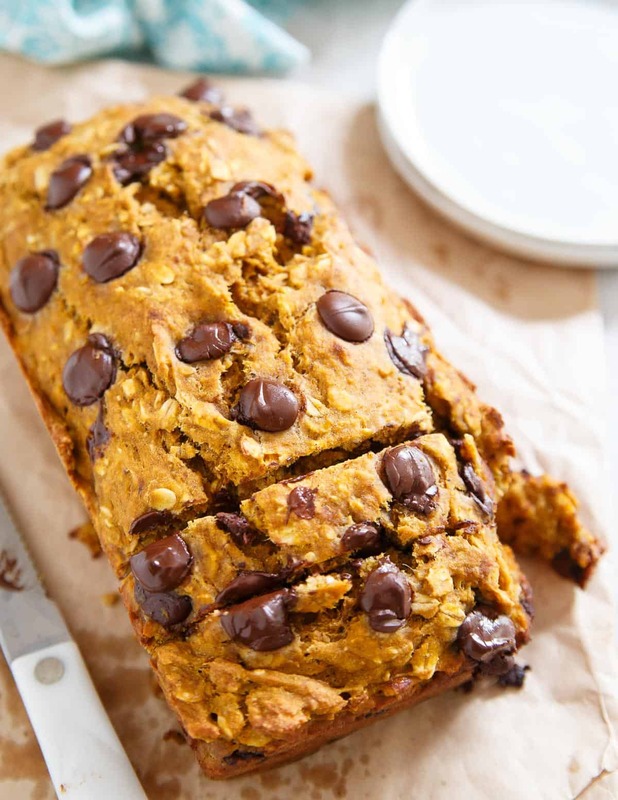 Pingback: Fall – Pumpkin Banana Chocolate Chip Bread | Maggie is Motivated! Pingback: Help… I overdosed on pumpkin! Pingback: Recipe Test Drive! | Life Half Crunched : A busy moms recipe for wellness - on a budget! Looks so yummy! Just wondering if regular whole wheat flour will have the same effect as the whole wheat pastry flour?? In the baking mood tonight and this is my winner! However, I don’t have any oats except steel-cut… any substitution suggestions? Hi Samantha- Sorry I didn’t get to this in time… If you haven’t made it yet, you could probably just use 2 cups of flour instead of 1 cup to make up for the 1 cup of oats. The texture will be a bit different but should probably still work. Dessert that can also be a breakfast? Count me in for sure! I love dessert for breakfast! Love that you only used 1 tbsp of oil. Nice. I make this a couple of days a week or so I’m confident when I make a couple of tweaks. I always make a double batch in a cake pan unless I”m gifting it. I use twice the bananas if I don’t have pumpkin. My last loaves had half of your https://www.runningtothekitchen.com/quick-simple-apple-pear-cranberry-sauce/ (pureed in the food prcessor) with bananas and it turned out great. I substitute 2/3 cup of molasses for the brown sugar and let the rolled oats soak in the liquid ingredients a bit to soften them up. My wife is vegan so I use flax seed meal and water in place of the egg(s). I also substituted raisins for chocolate chips until I found organic dried blueberries at Costco.